#5: 2014 paiN Gaming paiN Gaming’s Lineup Even though Brazil’s gaming culture is still in its infancy, it’s hard to argue against the fact that the Latin Americans have caught up fast. Even though Brazil’s gaming culture is still in its infancy, it’s hard to argue against the fact that the Latin Americans have caught up fast. In this year’s World Championship, we saw Brazil’s KaBuM! e-Sports convincingly knock the heavily-favored Alliance out of Group Stages. Most European LoL Fans will attribute the loss to Wickd’s painful to watch Kayle, or Froggen’s flashy and arrogant Fizz play during the match. In reality, the Wild Card Regions are a lot better than most of us would think. A perfect example of this statement would be the Brazilian Team paiN Gaming. Coached by NaJin Sword Veteran MaKNooN, this band of South Americans became the first team in Brazil to import talent from Korea, picking up the revered Bottom Lane Duo of Lactea and Olleh. 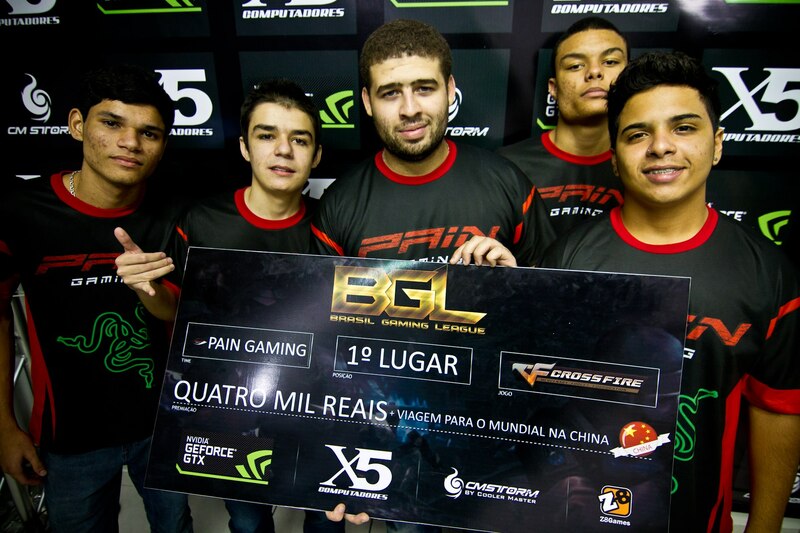 Regarded as the best team in Brazil currently, it still remains a mystery to some of why paiN Gaming wasn’t able to secure a spot in Riot’s Annual World Championship this year. Despite having a ton of hype surrounding them, the “Bro-Reans” had a lackluster showing in the Brazilian Regional Finals, placing 3rd/4th after a crushing 2-1 loss to CNB e-Sports. It seems as though paiN may be able to rebound this time, but they look doubtful to return to full form after the permanent departure of MaKNooN, who will be playing as Fusion Gaming’s Top Laner in the upcoming NA Spring Split Expansion Tournament. They’re down but not out, and we can all look forward to seeing the stars of paiN Gaming shine in the upcoming Split. For Singapore’s trademark League of Legends team, 2nd Place was all but expected for two years. The Sentinels were in command of their seasons through 2012 and 2013, never quite being able to take the first place spot in the Garena Pro League. They were able to finish as the runner-up in GPL Season 1, GPL Spring 2013, and GPL Summer 2013, which would have normally sent their team to the World Championship. At the time, the South East Asian scene was viewed as less developed than its western counterparts, and only one team from the GPL would advance to take on the best teams in the entire world. In their two years of prominent existence, the Sentinels were edged out of Worlds by the Taipei Assassins, and the Phillipine squad, Mineski. After failing to qualify for the World Championship in 2013, the Sentinels fell into a period of mediocrity, before disbanding nearly a year later. Now that the team has dissolved, all that’s left for them is a series of questions about what might have happened if they had performed on the world stage. Looking at CJ Blaze’s roster in early 2014, one might call them the “Future NA Transfer Team”. Sporting a roster with EG’s Helios and TSM’s Lustboy, CJ Entus Blaze was poised to take a Top 3 position in Korea and qualify for the League of Legends World Championship. At the time, Cpt. Jack was dubbed the King of Cleanse, considered as one of the premier AD Carries in his region. They placed 1st at NLB Winter in January, taking a 3-1 series off of OGN Powerhouse NaJin Black Sword. Unable to repeat that same success later in the season due to many roster changes, Blaze fell apart and ended up taking 9th Place in HOT6iX Summer. With star player Cpt Jack transfered to Jin Air, CJB just didn’t have the ability to recover from a Split that was beginning to turn into a downwards spiral. Things went from bad to worse when both CJ squads failed to make it out of the Group Stages of the Korean Playoff “Gauntlet”, with CJF and CJB finishing with mediocre 3-3 records. Despite a bleak looking future for Blaze, KESPA’s new “1 Team Per Organization” Rule may set CJ Entus ahead of their competition in 2015. If SHR Uzi’s soul manifested in any team, it would be the KT Rolster Arrows. While they’re nothing short of a hot mess in the regular season, KTA has shown us time and time again that they’re able to work magic in the Playoffs. They’re a chaotic bunch of passionate LoL players, who have nearly no results outside of their home country of Korea. In the 2014 HOT6iX Playoffs, The Arrows were dominant in their group, holding an impressive 5-1 record and advancing to the Quarterfinals along with the Jin Air Stealths, who placed second in Group D. Eccentric Jungle player KaKAO was on fire throughout the Playoffs, securing a Semifinals spot after a 3-2 win over NaJin White Shield. On the other side of the bracket, the Samsung Twins were smashing their opponents, usually ending a series in four games or less. In another thrilling 5 game struggle, KTA sent SK Telecom T1 S packing, winning the set 3 to 2 and advancing to the Finals. They would have to play against Samsung Blue, who had just defeated their future-World Champion sister team convincingly. The Final series between The Arrows and SSB became a 5 game dogfight, in which KTA pulled off a miracle upset and and ended up beating Blue to win the HOT6iX Summer Playoffs. KaKAO was voted the clear MVP of the entire tournament, barely edging out world-class Mid Laner Bae “Dade” Eo-Jin. Due to stringing together an average regular season, the KT Arrows were lacking the Circuit Points needed to auto-advance to the 2014 World Championship. In the infamous Korean Gauntlet, KTA tragically fell 3-0 to NaJin Shield, who were playing like Demigods during the Regional Finals. The KT Rolster Organization’s future is relatively unknown for now, with copious roster swaps and departures of iconic players like KaKAO plaguing the team during the offseason. Do you have any questions? Disagree with my team order? Feel free to leave your opinion in the comments section!